"Runners think about training their heart and legs, but they rarely think about training their lungs," says Mindy Solkin, owner and head coach of The Running Center in New York City. "A strong respiratory system can improve your running. It's a simple equation: Better breathing equals more oxygen for your muscles, and that equals more endurance." Just as we strength-train our hamstrings and calves to improve our ability to power over hills, we can tone the muscles used for breathing. "Exercise improves the conditioning of the diaphragm, the muscle that separates the chest from the abdomen, and the intercostal muscles, which lie between the ribs and enable you to inhale and exhale," says Everett Murphy, M.D., a runner and pulmonologist at Olathe Medical Center in Olathe, Kansas. "When you take a breath, 80 percent of the work is done by the diaphragm. If you strengthen your diaphragm, you may improve your endurance and be less likely to become fatigued." 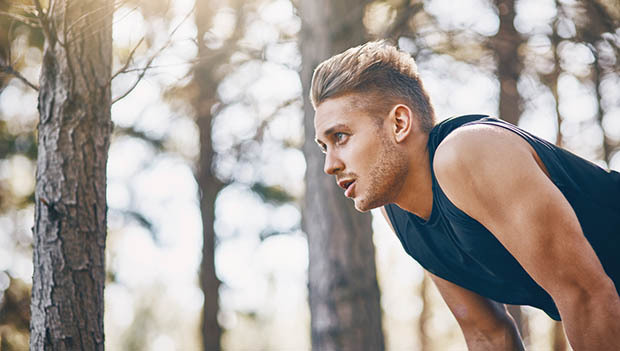 This was backed up by researchers from the Centre for Sports Medicine and Human Performance at Brunel University in England, who recently measured fatigue levels of marathoners' respiratory muscles and leg muscles. They found a direct link—runners whose breathing was the most strained showed the most leg weakness—and concluded in their study that the harder the respiratory muscles had to work, the more the legs would struggle in a race. The key to preventing lung- and leg-fatigue is breathing more fully. "When you take deeper breaths, you use more air sacs in your lungs, which allows you to take in more oxygen to feed your muscles," says David Ross, M.D., a pulmonologist at UCLA Medical Center. "When I'm running, I concentrate on taking slow and deep breaths to strengthen my diaphragm." Most runners, says Solkin, are "chest breathers" not "belly breathers." To help her clients see the difference, she has them run a mile at a pace that gets them huffing a bit. Then she has them stop and place one hand on their abdomen and one hand on their chest and watch. The lower hand should move with each breath, while the upper hand should remain relatively still (usually the opposite occurs). "Every time you breathe in, your belly should fill up like a balloon," says Solkin. "And every time you breathe out, that balloon should deflate. When you chest breathe, your shoulders get tense and move up and down. That's wasted energy—energy you should conserve for running." Chest breathing can be a hard habit to break-especially while you're preoccupied with keeping pace or calculating splits. One way to make the switch easier is to work on belly breathing when you're not running, and the skill will eventually carry over to your running. To make this happen, some elite runners turn to Pilates, a program originally developed as a rehabilitation program for World War I soldiers. Pilates aims to increase flexibility, strengthen the core, and improve breathing. "I try to do Pilates twice a week," says 2004 Olympic marathoner Colleen de Reuck. "It stretches my intercostal muscles and lengthens my spine, which helps my breathing and my running." "My athletes tell me 'my form is better, I'm not working so hard,'" says Pat Guyton, a Pilates instructor who teaches elite runners in Boulder, Colorado. "They mention less effort in the lungs-they're able to run farther before fatigue sets in."